Don’t transfuse more than the minimum number of red blood cell (RBC) units necessary to relieve symptoms of anemia or to return a patient to a safe hemoglobin range (7 to 8 g/dL in stable, non-cardiac in-patients). Transfusion of the smallest effective dose of RBCs is recommended because liberal transfusion strategies do not improve outcomes when compared to restrictive strategies. Unnecessary transfusion generates costs and exposes patients to potential adverse effects without any likelihood of benefit. Clinicians are urged to avoid the routine administration of 2 units of RBCs if 1 unit is sufficient and to use appropriate weight-based dosing of RBCs in children. Don’t test for thrombophilia in adult patients with venous thromboembolism (VTE) occurring in the setting of major transient risk factors (surgery, trauma or prolonged immobility). Thrombophilia testing is costly and can result in harm to patients if the duration of anticoagulation is inappropriately prolonged or if patients are incorrectly labeled as thrombophilic. Thrombophilia testing does not change the management of VTEs occurring in the setting of major transient VTE risk factors. When VTE occurs in the setting of pregnancy or hormonal therapy, or when there is a strong family history plus a major transient risk factor, the role of thrombophilia testing is complex and patients and clinicians are advised to seek guidance from an expert in VTE. Don’t use inferior vena cava (IVC) filters routinely in patients with acute VTE. IVC filters are costly, can cause harm and do not have a strong evidentiary basis. The main indication for IVC filters is patients with acute VTE and a contraindication to anticoagulation such as active bleeding or a high risk of anticoagulant-associated bleeding. Lesser indications that may be reasonable in some cases include patients experiencing pulmonary embolism (PE) despite appropriate, therapeutic anticoagulation, or patients with massive PE and poor cardiopulmonary reserve. Retrievable filters are recommended over permanent filters with removal of the filter when the risk for PE has resolved and/or when anticoagulation can be safely resumed. Don’t administer plasma or prothrombin complex concentrates for non-emergent reversal of vitamin K antagonists (i.e. outside of the setting of major bleeding, intracranial hemorrhage or anticipated emergent surgery). Blood products can cause serious harm to patients, are costly and are rarely indicated in the reversal of vitamin K antagonist s. In non-emergent situations, elevations in the international normalized ratio are best addressed by holding the vitamin K antagonist and/or by administering vitamin K.
CT surveillance in asymptomatic patients in remission from aggressive non-Hodgkin lymphoma may be harmful through a small but cumulative risk of radiation-induced malignancy. It is also costly and has not been demonstrated to improve survival. Physicians are encouraged to carefully weigh the anticipated benefits of post-treatment CT scans against the potential harm of radiation exposure. Due to a decreasing probability of relapse with the passage of time and a lack of proven benefit, CT scans in asymptomatic patients more than 2 years beyond the completion of treatment are rarely advisable. Don’t treat with an anticoagulant for more than three months in a patient with a first venous thromboembolism (VTE) occurring in the setting of a major transient risk factor. Anticoagulation is potentially harmful and costly. Patients with a first VTE triggered by a major, transient risk factor such as surgery, trauma or an intravascular catheter are at low risk for recurrence once the risk factor has resolved and an adequate treatment regimen with anticoagulation has been completed. Evidence-based and consensus guidelines recommend three months of anticoagulation over shorter or longer periods of anticoagulation in patients with VTE in the setting of a reversible provoking factor. By ensuring a patient receives an appropriate regimen of anticoagulation, clinicians may avoid unnecessary harm, reduce health care expenses and improve quality of life. This Choosing Wisely® recommendation is not intended to apply to VTE associated with non-major risk factors (e.g., hormonal therapy, pregnancy, travel-associated immobility, etc. ), as the risk of recurrent VTE in these groups is either intermediate or poorly defined. Don’t routinely transfuse patients with sickle cell disease (SCD) for chronic anemia or uncomplicated pain crisis without an appropriate clinical indication. Patients with SCD are especially vulnerable to potential harms from unnecessary red blood cell transfusion. In particular, they experience an increased risk of alloimmunization to minor blood group antigens and a high risk of iron overload from repeated transfusions. Patients with the most severe genotypes of SCD with baseline hemoglobin (Hb) values in the 7-10 g/dl range can usually tolerate further temporary reductions in Hb without developing symptoms of anemia. Many patients with SCD receive intravenous fluids to improve hydration when hospitalized for management of pain crisis, which may contribute to a decrease in Hb by 1-2 g/dL. Routine administration of red cells in this setting should be avoided. Moreover, there is no evidence that transfusion reduces pain due to vaso-occlusive crises. For a discussion of when transfusion is indicated in SCD, readers are referred to recent evidence-based guidelines from the National Heart, Lung, and Blood Institute (NHLBI) (see reference below). Don’t perform baseline or routine surveillance computed tomography (CT) scans in patients with asymptomatic, early-stage chronic lymphocytic leukemia (CLL). In patients with asymptomatic, early-stage CLL, baseline and routine surveillance CT scans do not improve survival and are not necessary to stage or prognosticate patients. CT scans expose patients to small doses of radiation, can detect incidental findings that are not clinically relevant but lead to further investigations and are costly. For asymptomatic patients with early-stage CLL, clinical staging and blood monitoring is recommended over CT scans. Don’t test or treat for suspected heparin-induced thrombocytopenia (HIT) in patients with a low pre-test probability of HIT. In patients with suspected HIT, use the “4T’s” score to calculate the pre-test probability of HIT. This scoring system uses the timing and degree of thrombocytopenia, the presence or absence of thrombosis, and the existence of other causes of thrombocytopenia to assess the pre-test probability of HIT. HIT can be excluded by a low pre-test probability score (4T’s score of 0-3) without the need for laboratory investigation. Do not discontinue heparin or start a non-heparin anticoagulant in these low-risk patients because presumptive treatment often involves an increased risk of bleeding, and because alternative anticoagulants are costly. Don’t treat patients with immune thrombocytopenic purpura (ITP) in the absence of bleeding or a very low platelet count. Treatment for ITP should be aimed at treating and preventing bleeding episodes and improving quality of life. Unnecessary treatment exposes patients to potentially serious treatment side effects and can be costly, with little expectation of clinical benefit. The decision to treat ITP should be based on an individual patient’s symptoms, bleeding risk (as determined by prior bleeding episodes and risk factors for bleeding such as use of anticoagulants, advanced age, high-risk activities, etc. ), social factors (distance from the hospital/travel concerns), side effects of possible treatments, upcoming procedures, and patient preferences. In the pediatric setting, treatment is usually not indicated in the absence of mucosal bleeding regardless of platelet count. In the adult setting, treatment may be indicated in the absence of bleeding if the platelet count is very low. However, ITP treatment is rarely indicated in adult patients with platelet counts greater than 30,000/microL unless they are preparing for surgery or an invasive procedure, or have a significant additional risk factor for bleeding. In patients preparing for surgery or other invasive procedures, short-term treatment may be indicated to increase the platelet count prior to the planned intervention and during the immediate post-operative period. The American Society of Hematology (ASH) is the world’s largest professional society of hematologists, serving more than 14,000 clinicians and scientists from around the world who are dedicated to furthering the understanding, diagnosis, treatment and prevention of disorders affecting the blood. For more than 50 years, the Society has led the development of hematology as a discipline by promoting research, patient care, education, training and advocacy in hematology. By providing a forum for clinicians and scientists to share the latest discoveries in the field, ASH is helping to improve care and possibly lead to cures for diseases that affect millions of people, including leukemia, lymphoma, myeloma, anemias and various bleeding and clotting disorders. For more information, visit www.hematology.org. 1-5: The American Society of Hematology (ASH) Choosing Wisely® Task Force utilized a modified Delphi technique to collect suggestions from committee members and recipients of its clinically focused newsletter, the ASH Practice Update. Respondents were asked to consider the core values of harm, cost, strength of evidence, frequency and control. Fifty-nine of 167 ASH committee members (35%) and 2 recipients of the ASH Practice Update submitted 81 unique suggestions. The Task Force used a nominal group technique (NGT) to identify the top 20 items, which were scored by ASH committee and practice community members, with a 46 percent participation rate. ASH’s Task Force reviewed all scores to develop a 10-item list. A professional methodologist conducted a systematic literature review on each of the 10 items; the Task Force chair served as the second reviewer. Evidence reviews and source material for the 10 items were shared with ASH’s Task Force, which ranked the items according to the core values. The Task Force then identified the top 5 items plus 1 alternate. ASH member content experts provided external validation for the veracity and clarity of the items. 6–10: Suggestions for the second ASH Choosing Wisely list were solicited from members of the ASH Committee on Practice, the ASH Committee on Quality, the ASH Choosing Wisely Task Force, ASH Consult-a-Colleague volunteers and members of the ASH Practice Partnership. Six principles were used to prioritize items: avoiding harm to patients, producing evidence-based recommendations, considering both the cost and frequency of tests and treatments, making recommendations in the clinical purview of the hematologist, and considering the potential impact of recommendations. Harm avoidance was established as the campaign’s preeminent guiding principle. 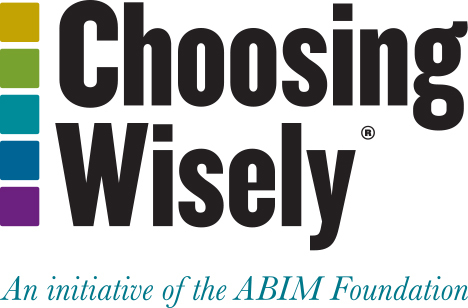 Guided by the 6 principles, the ASH Choosing Wisely Task Force scored all suggestions. Modified group technique was used to select 10 semi-finalist items. Systematic reviews of the literature were then completed for each of the 10 semi-finalist items. Guided by the 6 core principles outlined above, and by the systematic reviews of the evidence, the ASH Choosing Wisely Task Force selected 5 recommendations for inclusion in ASH’s second Choosing Wisely Campaign. ASH’s disclosure and conflict of interest policy can be found at www.hematology.org. Carson JL, Grossman BJ, Kleinman S, Tinmouth AT, Marques MB, Fung MK, Holcomb JB, Illoh O, Kaplan LJ, Katz LM, Rao SV, Roback JD, Shander A, Tobian AA, Weinstein R, Swinton McLaughlin LG, Djulbegovic B; Clinical Transfusion Medicine Committee of the AABB. Red blood cell transfusion: a clinical practice guideline from the AABB. Ann Intern Med. 2012 Jul 3;157(1):49–58. Retter A, Wyncoll D, Pearse R, Carson D, McKechnie S, Stanworth S, Allard S, Thomas D, Walsh T; British Committee for Standards in Hematology. Guidelines on the management of anaemia and red cell transfusion in adult critically ill patients. Br J Haematol. 2013 Feb;160(4):445–64. Chong LY, Fenu E, Stansby G, Hodgkinson S. Management of venous thromboembolic diseases and the role of thrombophilia testing: summary of NICE guidance. BMJ. 2012 Jun 27;344:e3979. Baglin T, Gray E, Greaves M, Hunt BJ, Keeling D, Machin S, Mackie I, Makris M, Nokes T, Perry D, Tait RC, Walker I, Watson H; British Committee for Standards in Hematology. Clinical guidelines for testing for heritable thrombophilia. Br J Haematol. 2010 Apr;149(2):209–20. Dupras D, Bluhm J, Felty C, Hansen C, Johnson T, Lim K, Maddali S, Marshall P, Messner P, Skeik N. Venous thromboembolism diagnosis and treatment. Bloomington (MN): Institute for Clinical Systems Improvement (ICSI); 2013 Jan. 90 p.
Kearon C, Akl EA, Comerota AJ, Prandoni P, Bounameaux H, Goldhaber SZ, Nelson ME, Wells PS, Gould MK, Dentali F, Crowther M, Kahn SR; American College of Chest Physicians. Antithrombotic therapy for VTE disease: Antithrombotic Therapy and Prevention of Thrombosis, 9th ed: American College of Chest Physicians Evidence-Based Clinical Practice Guidelines. Chest. 2012 Feb;141(2 Suppl):e419S–94S. National Institute for Health and Clinical Excellence (NICE). Venous thromboembolic diseases: the management of venous thromboembolic diseases and the role of thrombophilia testing. 2012 Jun:NICE clinical guideline;no.144. Jaff MR, McMurtry MS, Archer SL, Cushman M, Goldenberg N, Goldhaber SZ, Jenkins JS, Kline JA, Michaels AD, Thistlethwaite P, Vedantham S, White RJ, Zierler BK; American Heart Association Council on Cardiopulmonary, Critical Care, Perioperative and Resuscitation; American Heart Association Council on Peripheral Vascular Disease; American Heart Association Council on Arteriosclerosis, Thrombosis and Vascular Biology. Management of massive and submassive pulmonary embolism, iliofemoral deep vein thrombosis, and chronic thromboembolic pulmonary hypertension: a scientific statement from the American Heart Association. Circulation.2011 Apr 26;123(16):1788–830. Holbrook A, Schulman S, Witt DM, Vandvik PO, Fish J, Kovacs MJ, Svensson PJ, Veenstra DL, Crowther M, Guyatt GH; American College of Chest Physicians. Evidence-based management of anticoagulant therapy: Antithrombotic Therapy and Prevention of Thrombosis, 9th ed: American College of Chest Physicians Evidence-Based Clinical Practice Guidelines. Chest. 2012 Feb;141(2 Suppl):e152S–84S. Scottish Intercollegiate Guidelines Network (SIGN). Antithrombotics: indications and management. Edinburgh (UK): 2012. 75 p. Report No. 129. Zelenetz AD, Wierda WG, Abramson JS, Advani RH, Andreadis CB, Bartlett N, Bellam N, Byrd JC, Czuczman MS, Fayad LE, Glenn MJ, Gockerman JP, Gordon LI, Harris NL, Hoppe RT, Horwitz SM, Kelsey CR, Kim YH, Krivacic S, LaCasce AS, Nademanee A, Porcu P, Press O, Pro B, Reddy N, Sokol L, Swinnen L, Tsien C, Vose JM, Yahalom J, Zafar N, Dwyer MA, Naganuma M; National Comprehensive Cancer Network. National Comprehensive Cancer Network (NCCN) Clinical Practice Guidelines in Oncology: non-Hodgkin’s lymphomas: Version 1.2013. Fort Washington (PA): NCCN.2013. Lin TL, Kuo MC, Shih LY, Dunn P, Wang PN, Wu JH, Tang TC, Chang H, Hung YS, Lu SC. Value of surveillance computed tomography in the follow-up of diffuse large B-cell and follicular lymphomas. Ann Hematol. 2012 Nov;91(11):1741–5. Guppy AE, Tebbutt NC, Norman A, Cunningham D. The role of surveillance CT scans in patients with diffuse large B-cell non-Hodgkin’s lymphoma. Leuk Lymphoma.2003 Jan;44(1):123–5. Shenoy P, Sinha R, Tumeh JW, Lechowicz MJ, Flowers CR. Surveillance computed tomography scans for patients with lymphoma: is the risk worth the benefits? Clin Lymphoma Myeloma Leuk. 2010 Aug;10(4):270–7. Kearon C, Akl EA, Comerota AJ, Prandoni P, Bounameaux H, Goldhaber SZ, Nelson ME, Wells PS, Gould MK, Dentali F, Crowther M, Kahn SR; American College of Chest Physicians. Antithrombotic therapy for VTE disease: Antithrombotic Therapy and Prevention of Thrombosis, 9th ed: American College of Chest Physicians Evidence-Based Clinical Practice Guidelines. [Erratum appears in Chest. 2012 Dec;142(6):1698-1704]. Chest. 2012 Feb;141(2 Suppl):e419S–94S. Chalmers E, Ganesen V, Liesner R, Maroo S, Nokes T, Saunders D, Williams M; British Committee for Standards in Haematology. Guideline on the investigation, management and prevention of venous thrombosis in children. Br J Haematol. 2011 Jul;154(2):196–207. Monagle P, Chan AK, Goldenberg NA, Ichord RN, Journeycake JM, Nowak-Göttl U, Vesely SK; American College of Chest Physicians. Antithrombotic therapy in neonates and children: Antithrombotic Therapy and Prevention of Thrombosis, 9th ed: American College of Chest Physicians Evidence-Based Clinical Practice Guidelines. Chest. 2012 Feb;141(2 Suppl):e737S–801S. Evidence-based management of sickle cell disease: expert panel report, 2014. Washington (DC): National Institutes of Health, National Heart, Lung, and Blood Institute; 2014. 161 p.
Blood transfusion guideline. Dutch Institute for Healthcare Improvement CBO; 2011. 402 p.
Oscier D, Dearden C, Eren E, Fegan C, Follows G, Hillmen P, Illidge T, Matutes E, Milligan DW, Pettitt A, Schuh A, Wimperis J; British Committee for Standards in Haematology. Guidelines on the diagnosis, investigation and management of chronic lymphocytic leukaemia. Br J Haematol. 2012 Dec;159(5):541–64. Eichhorst B, Hallek M, Dreyling M, Group EGW. Chronic lymphocytic leukaemia: ESMO Clinical Practice Guidelines for diagnosis, treatment and follow-up. Ann Oncol. 2010 May;21 Suppl 5:v162–4. Watson H, Davidson S, Keeling D. Guidelines on the diagnosis and management of heparin-induced thrombocytopenia: second edition. Br J Haematol. 2012;159(5):528–40. Cuker A, Gimotty PA, Crowther MA, Warkentin TE. Predictive value of the 4Ts scoring system for heparin-induced thrombocytopenia: a systematic review and meta-analysis. Blood. 2012;120:4160–7. Neunert C, Lim W, Crowther M, Cohen A, Solberg L Jr., Crowther MA; American Society of Hematology. The American Society of Hematology 2011 evidence-based practice guideline for immune thrombocytopenia. Blood. 2011 Apr 21;117(16):4190–207.